– G. C. Watkins, “The Hotelling Principle: Autobahn or Cul de Sac?,” The Energy Journal, Vol. 13-1, 1992, pp. 22-23. The gains in U.S. crude oil production in just the past four years have been impressive. Here is where those gains are coming from. U.S. crude oil production, after sinking to levels not seen since the mid-1940s, rose more than half a million barrels per day between 2007 and 2011. That size of increase has not been witnessed in the U.S. for more than forty years. The source of that large gain certainly did not occur in the federal offshore, which, with 2011’s unusually sharp drop of nearly 240,000 barrels per day netted an increase of just under 30,000 barrels per day over the four-year period. It was onshore (including state waters) where production r0se from a 2007 low of 3.7 million barrels per day to 4.3 million barrels per day, a surge of some 570,000 barrels per day. This increase does not even include the jump in the nation’s output of natural gas liquids (NGLs), which reached a record 2.18 million barrels per day in 2011 – an increase of 400,000 barrels per day since 2007. NGLs and crude oil increases together yield a gain of nearly 1 million barrels per day in just four years – an increase of nearly 15 percent. And these increased barrels mean increased jobs. According to the Bureau of Labor Statistics, the number of Americans now employed in oil and gas development and support activities has grown by more than 100,000 in five years – from 344,000 jobs in mid-2007 to 454,100 in March 2012. The accompanying chart breaks out crude oil production’s increases and declines for major states and federal offshore regions. 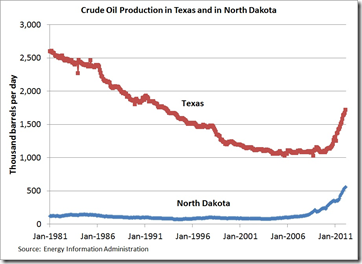 Texas and North Dakota clearly stand out as major forces behind the increase, with 373,000 b/d and 296,000 b/d gains, respectively, between 2007 and 2011. But 15 other states (including a 40,000 barrels per day net rise for the Gulf’s federal offshore) collectively account for another 200,000 barrels per day. Based on Energy Information Administration (EIA) data, liquids production from federal leases rose less than 60,000 barrels per day over this period. On the other hand, more than 90 percent of the increase in liquids output came from non-federal lands. When all oil, natural gas, and NGL production from federal leases are combined, the total (on a BTU basis) dropped nearly 9 percent and, from 2003, by more than 20 percent. Applaud the initiatives on private and state lands for leading the energy production drive: combined production of oil, NGLs, and natural gas on non-federal lands jumped 26 percent from 2007 to 2011. Texas and North Dakota are the two states with the largest increases. They contain the plays with the highest rig counts, and together have added tens of thousands of direct jobs in the oil and gas industry over the past four years. A future article will look at the other states also contributing to the increase in U.S. crude oil production, since advances in technology are producing a continental resurgence. North Dakota’s production has surged an impressive 240 percent over the past four years, thanks to developments in the Williston Basin, which includes the Bakken and the Three Forks plays. Throughout the 1990s and early 2000s, crude oil production in North Dakota plodded along at less than 100,000 barrels per day, sourced from about 3,000 wells. But thanks to independents’ efforts in deploying horizontal drilling and fracturing technology, production moved past the 100,000 barrels per day mark in 2006, averaged over 400 thousand barrels per day in 2011, and most recently has reached nearly 560,000 barrels per day, producing from over 6,000 wells. 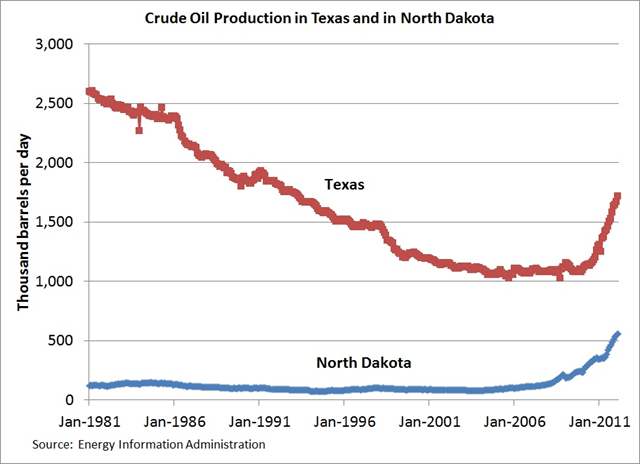 North Dakota has replaced California as the third largest producing state after Texas and Alaska. Currently, around 200 rigs are active in the state, almost all drilling horizontally. Compare that with 40 rigs in 2007. The Bakken has been covered in previous articles, including the dramatic changes in its estimated technically recoverable reserves and infrastructure challenges. Though holding on to its title as the largest producing state, Texas’ production steadily declined from the 1970s through the middle of the last decade. Then, production leveled off for a few years and rose modestly by 65 thousand barrels in 2010. But 2011’s increase of nearly 290,000 barrels per day made the change of course unmistakable, a volumetric increase the size of which had not been seen in that state for more than half a century. 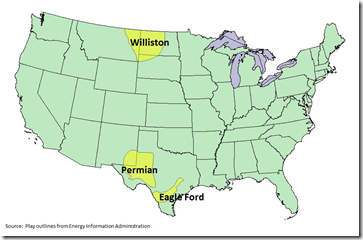 By early 2012, Texas production was reaching 1.7 million barrels per day. 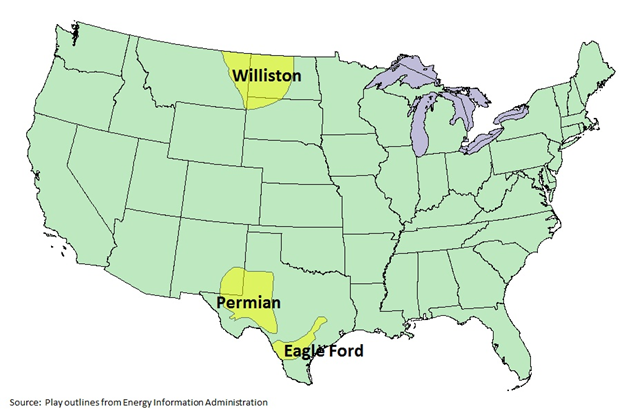 While Texas has many plays, two of special significance are the Eagle Ford in southwestern Texas and the Permian in western Texas and parts of New Mexico. Production in the Eagle Ford counties averaged only about 3,000 barrels per day as recently as 2009, but reached nearly 140,000 barrels per day in 2011. Last year’s increase alone, at over 100,000 barrels per day, accounted for roughly a third of the year’s entire increase in Texas crude oil production. The rapidity of the rise for Eagle Ford can be seen in projections by some for April 2012 of over half a million barrels per day (Bentek projection as cited by EIA). Currently, more than a quarter of all active rigs in Texas are at work in the Eagle Ford. The Permian Basin has been a target of oil and gas exploration and development since the first well was drilled in 1921, and currently hosts 65,000 producing oil wells – about 40 percent of all oil wells producing in Texas. However, because of technological advances, estimates of technically recoverable reserves there have grown significantly, and activity has picked up. Still, there are challenges, including water management in a region with many competing water needs and the danger of a dunes sagebrush lizard listing under the Endangered Species Act, which would impose restrictions on development. U.S. gains in crude oil production, though especially strong in some regions, have been widespread among many key producing states. Technological advances in which independents have played a significant part have been game changers across a broad spectrum of American resource plays. Look for future Declaration of Independents pieces to cover other important regions. Less than a year ago, I reported a positive reversal in U.S. liquids production through 2010. Add another 300,000 barrels per day to American liquid production for 2011 annual average. So far in early 2012, the trend, if anything, has accelerated; U.S. liquids production in January and February has already been beating the 2011 average by an additional 660,000 barrels per day. This has helped U.S. import dependence drop from 50.4 percent in January 2010 to just under 40 percent in February 2012. This demonstrates that oil and natural gas resources, at least the economically and technically recoverable kind, are not a static figure, but can evolve dramatically when technological advances and human ingenuity come into play. Julia Bell is Manager of Public & Industry Affairs at the Independent Petroleum Association of America (IPAA) in Washington, D.C. This article was produced by IPAA’s economics team of Frederick Lawrence and Ron Planting. PA is the rising star of natural gas liquids (NGL). Increased production in oil is probably more dependent on its high market price than on technological advances and human ingenuity per se, yet the author doesn’t mention this factor at all. It’s only because of that that the technologies are usable. – David Osterfeld, Prosperity Versus Planning: How Government Stifles Economic Growth (New York: Oxford University Press, 1992), p. 91. North Dakota’s rise to be being the second largest producer of oil in the US is not solely do to the price of oil (which is nearly the same across the US.) North Dakota’s rise to number two (just past Alaska a few days ago) is due to the recently developed technology for fracturing natural gas wells. It’s only been fairly recently that companies have perfected the art of fracturing (i.e. using the right diameters of sand particles and using the correct mix of surfactants) and perfected the art of horizontal drilling. In addition, companies are designing stronger drill bits than let’s say 30 years ago. If your question is: can the US still be economically producing this much oil if the price of oil were to drop to $40/barrel? My answer is: Probably not right now. But the oil/gas industry may still yet have some aces up their sleeves. There might be some technologies that they are developing right now (that we don’t hear about in the media) that could made it possible to produce significant quantities of oil/gas from places like North Dakota.